Trust and confidence in our economic and financial institutions has collapsed. The last few years alone have witnessed accounting, banking and corporate tax scandals; environmental disasters; financial crises, fraud and money laundering at unprecedented levels. The pace and scale of the failures is intensifying and look set to increase in the future. 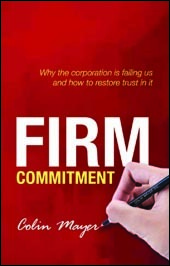 Colin Mayer, Professor of Finance at Sa?d Business School, University of Oxford, has published an outspoken book Firm Commitment on the breakdown of trust - its causes, consequences and what we should do to fix it. Mayer places the corporation at the centre of this failure of trust and at the heart of our current problems. He argues that the corporation is no longer serving the interests of society at large and has been hijacked by one particular interest group, its shareholders. ‘The corporation is arguably the most important institution in the world - an institution that employs us and invests our savings, and is the source of economic growth and prosperity around the world. Yet the corporation has lost its purpose and become dominated by short-term financial concerns to the exclusion of all others and to the detriment of us as its customers, employees and communities’. Many of the most successful corporations in the world already display these characteristics. Tata, the Indian conglomerate, owner of Jaguar Land Rover and Corus Steel, is controlled by a foundation that is responsible for ensuring that its operating companies abide by the group’s principles and values. Bertelsmann, the media company, Carlsberg, the brewery, and Robert Bosch, the automotive components company, have similar arrangements. 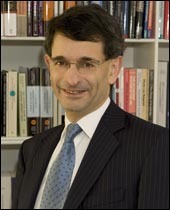 Colin Mayer is the Peter Moores Professor of Management Studies at Saïd Business School at the University of Oxford and is a leading expert on issues of corporate governance and regulation. Mayer’s research is currently concerned with international comparisons of financial systems and corporate governance and their effects on the financing and control of corporations. Mayer is an Ordinary Member of the UK Competition Appeal Tribunal, a member of the UK Government Natural Capital Committee and a Founding Fellow of the European Corporate Governance Institute. He was the first professor in the Saïd Business School in 1994 and its Dean from 2006 to 2011. He was chairman of Oxera between 1986 and 2010 and assisted in developing the firm into what is now one of the largest independent economics consultancies in the UK.